Me too. It's what keeps me motivated. 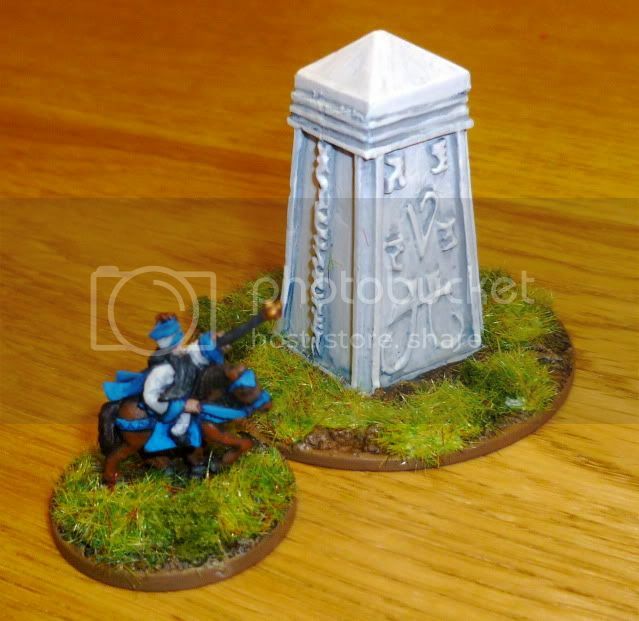 Wow, they are small, or are GW's big (12mm)? 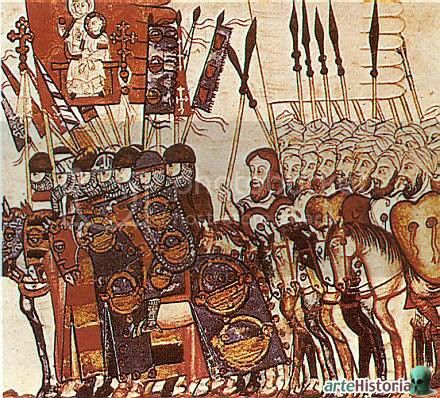 I really like the way you're referencing historical images, it's got me all excited about getting a medieval army lined up (though I need to find the WM Medieval book first!). When I get round to it I am thinking about trying the TB Line figures that have been shown on the Market Place a couple of times. Have you seen them 'in the flesh'? 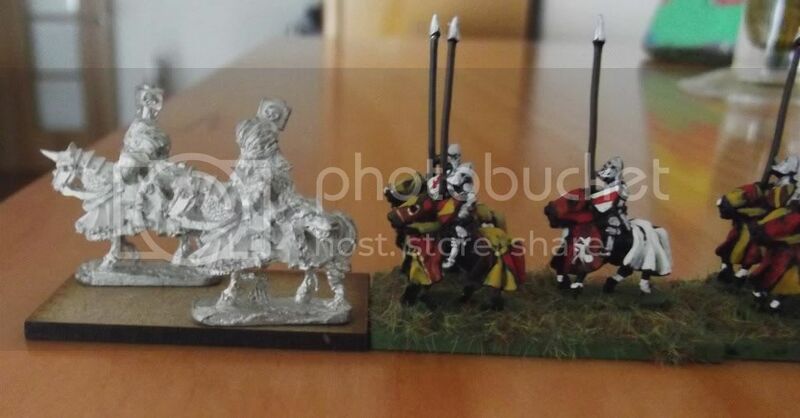 These Look more like Ostland and Stirland Knights to me. 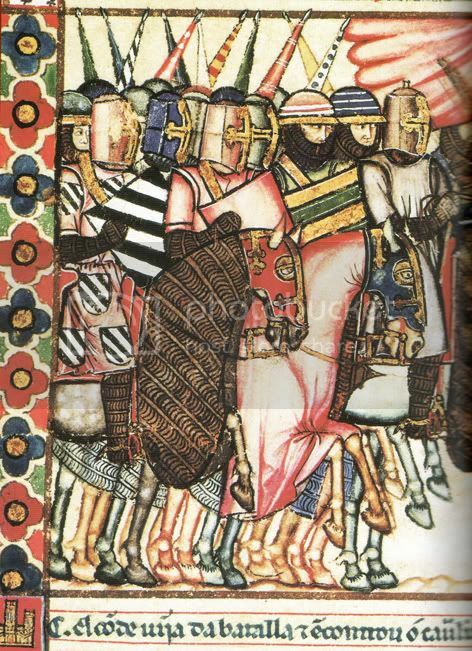 @ doubleclickhere: Yea Ostland , I also see them with some bretonian style. @ pw: could be some differences in size but in the middle of a battle does not any problem for me. About TB line, I have to say I am very interested in that manufacture. It seems quality figures with low prices. I have never seen the figures "in the flesh". 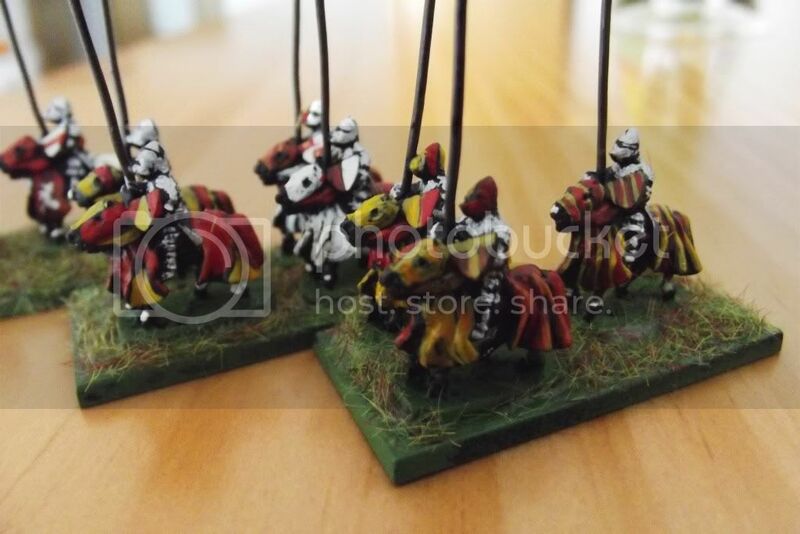 It is a pitty I have almost my medieval army bought right now. But when they will be painted then I am sure I will have to expand the armies and then I will go for some TB reinforcement. I've got a character stand done. And I've started on my General! 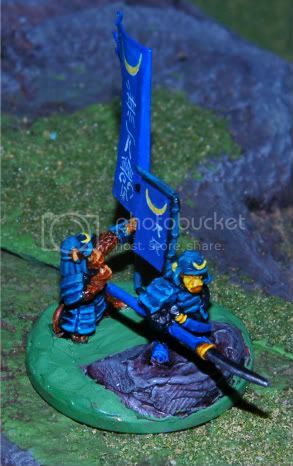 I will post pictures tonight, along with a link that I am using as a guide for painting my Nippon army. 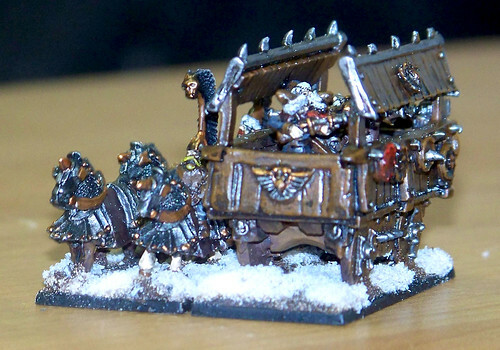 The Warmaster Event that I organized on the 21st sorta threw off the painting schedule! 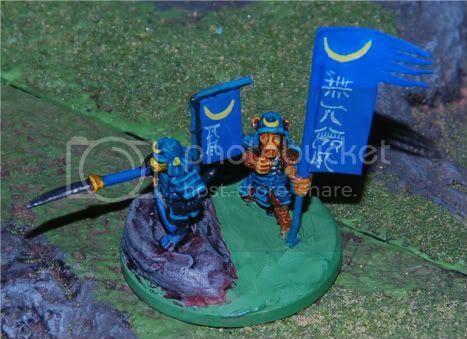 The Hero is a converted Samurai Ape from Pendraken. I cut the arm from the shoulder, and bent the arm down so that the Naginata was level, making it almost look like he's gesturing with his weapon. Another conversion in the background. 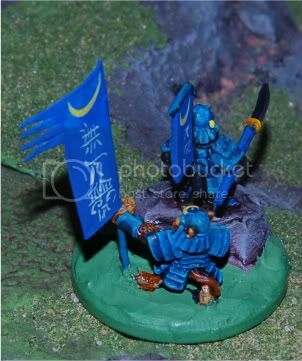 A Samurai Ape archer had the bow cut away and replaced with a banner. The kneeling and fist-to-chest position shows proper respect for his lord's honour. No flocking was (yet) harmed in making this character stand. The hero has a yellow face and ears. Samurai would often wear masks into battle, and this leader is doing the same. As a bit of humour, the cresents are painted as bananas, and the cresents on the banners are pretty close to bananas themselves. You could say I went bananas when I did the heraldry for this one. At some point, I will use the above webpages to come up with different sashimono (back banners) for my Samurai. There are some pretty interesting sashimono that were used. I'm not following any house or clan, but am using color choices or banners that catch my eye. I am not (yet) a big Samurai fan, as I am doing this to pull a friend of mine more firmly into Warmaster (and he is a Samurai fan). The hero is awesome! I love the kanjis, very sharp. Can't see the bananas, but the yellow face is really great. 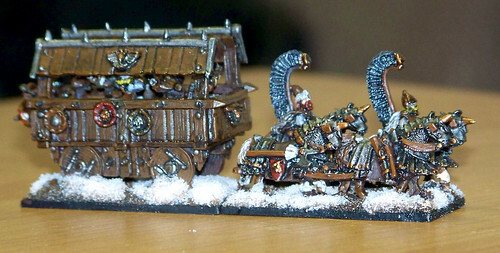 Conversions always give a sense of unique army. Did you pinhole each figure to attach the shashami? where do you buy the shashamis? Pendraken sells packs of sashimono. I've been using mostly those. I also built some from paperclips, plastic card, and superglue. That was a lot of fiddly work. 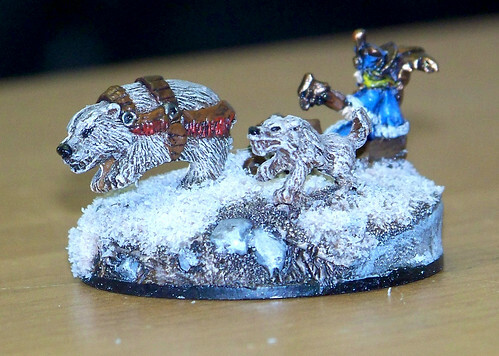 I drill a hole into the back of the miniature. I bend the very tip of the sashimono to fit into the hole. For now I've been using super glue to glue the back banner in place. It sets more quickly than epoxy. If you'd like, I can take some close-up photos of the attachement point so you can see. I can also take some pictures of the process, if that helps. If you'd like, I can take some close-up photos of the attachement point so you can see. I can also take some pictures of the process, if that helps. I like the monkey . Here the Light Wizard is sucking some of its powerful juice into his magic staff. Building terrain and scenery is as important as having an army, and your waystone thingy is pretty cool. 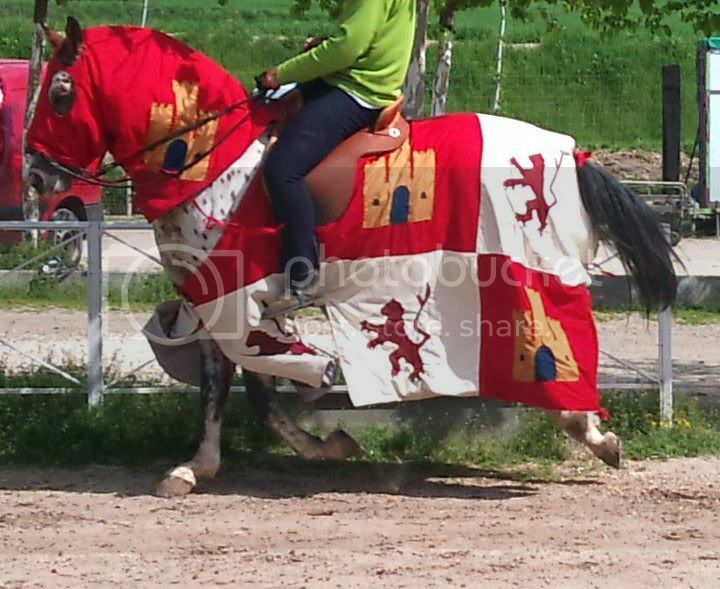 Also the mage on horse. wow the characters are impressive. 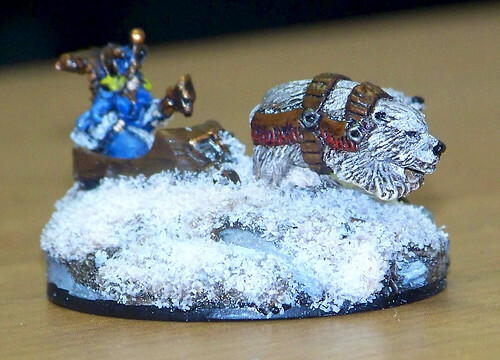 Really like the tzarina katerina in a bear pulled slide. And the mage with the hawk is awesome!! where did you get the bird ?